Locked and loaded, the F-15E fighter can carry seven groups of four StormBreaker bombs from Raytheon, for a total of 28 weapons. Raytheon's StormBreaker bomb, the U.S. Air Force’s newest weapon, has entered the operational testing phase (OTP). 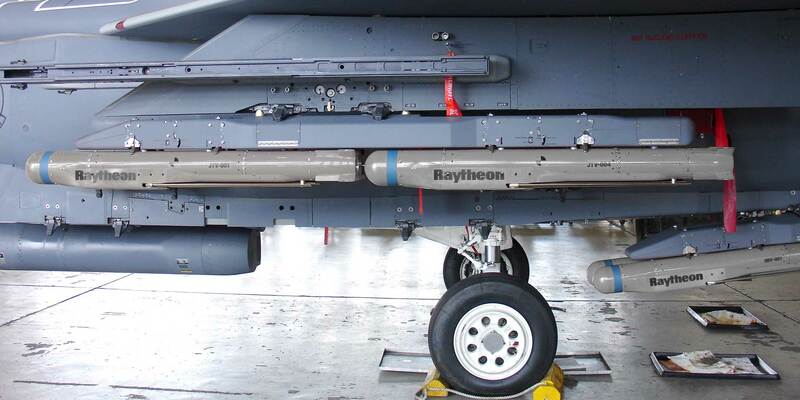 Raytheon, the U.S. Air Force (USAF) and U.S. Navy have begun StormBreaker bomb integration activities on the F-35, F/A-18E/F, and F-15E, the company (Chalet C9, Outdoor Exhibit 9) announced Monday. According to Raytheon officials, it is a big milestone applying the new seeker, which works in three modes—an imaging infrared, for enhanced target discrimination; a millimeter wave radar; and a semi-active laser that enables the weapon to track an airborne laser designator or one on the ground provided by a joint terminal attack controller. Using folding wings, the bomb’s range exceeds 72 km (45 miles), providing standoff capability. One of StormBreaker's key features is the ability to allow warfighters to tackle moving targets in adverse weather, according to Raytheon officials. Née Small Diameter Bomb II (SDB II), StormBreaker, with its tri-mode seeker, is getting a step closer to providing USAF pilots a capability to strike maneuvering targets. Cristy Stagg, program director, told AIN that, because of one of its competitors, it recently changed the name of the weapon to StormBreaker. Beginning the operational tests with an F-15E as a platform could be of interest for other air forces fielding that aircraft on the international market, said Raytheon Missile Systems senior manager for business development J. Michael Heyser, addressing future international market options. The other threshold platform, from international viewpoint the key could be the F-35A aircraft, he added. The first export deal involves Australia within the framework of the foreign military sales program. According to Heyser, the next wave of customers could be Europeans, but there is no firm time-schedule. For the U.S. Navy, integration of the new weapon onto the carrier-capable F/A-18E/F Super Hornet have begun.